Throughout our entire lives we are blessed with emotions. We smile, laugh and even frown. These emotions cause muscle activity, which result in wrinkles. While you have earned every emotion, you may want to hide the results and that’s where BOTOX® comes in. BOTOX® therapy is a simple, non-surgical procedure that softens facial wrinkles, creating a younger and more refreshed looking face. We’re ready to do all that we can to keep you looking great! Tiny amounts of BOTOX® are injected into specific facial muscles to eliminate frown lines between the eyebrows; horizontal forehead wrinkles and crows feet around the eyes. The muscles in these areas are immobilized, the lines gradually smooth out from disuse, and new creases are prevented from forming. 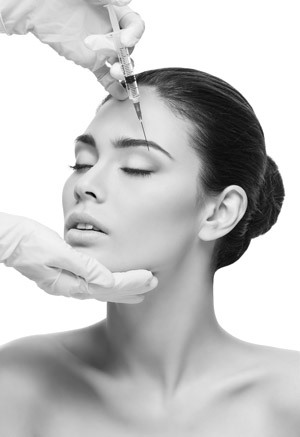 BOTOX® is now widely being used for facial reshaping. Redefining and changing the appearance of your face for a more pleasing appearance. With selective injections, we can reposition your eyebrows, reduce ‘bunny lines’ between the eyes and around your nose, enhance your lips and can also reduce muscle function to conceal a ‘gummy’ smile without surgery. It is important to remember that BOTOX® affects only the specific treated muscles, leaving the surrounding muscles to function as usual. It cannot “freeze” your facial expressions. The treatment takes around 10 minutes. After injection, it takes 3 to 5 days to begin taking effect and up to 7 days to see the full effect. BOTOX® therapy is temporary and usually lasts 2 to 4 months, depending on the individual. Eventually the effect gradually fades and muscle action returns. BOTOX® was approved by the US FDA in 1989, and has the longest period of proven clinical testing and safety in the world. The safety profile of BOTOX® is considered to be excellent. It has been used for patients with various conditions for over 10 years in over 60 countries. Patients who are pregnant, nursing, allergic to albumin (eggs), taking certain antibiotics, affected by any neuromuscular or collagen vascular disease, or that have had any recent eye surgery may not use BOTOX®. For more information on the benefits of BOTOX®, schedule an appointment with Dr. Mabourakh.